What’s the most important info to put on a dog’s ID tag? My pets’ tags are simple. Their tags include their names and two phone numbers (my cell and my husband’s cell). But is that the best info? Obviously the more info you can put on the tags, the better. That’s a lot of important info crammed onto one little name plate! It got me thinking … am I including enough info on my pets’ tags?! This post is sponsored by dogIDs. One idea the company suggested is to specify on the tag if your dog has any major medical issues. For example, maybe your dog needs medication such as insulin and someone who finds your dog would have no way of knowing this otherwise. 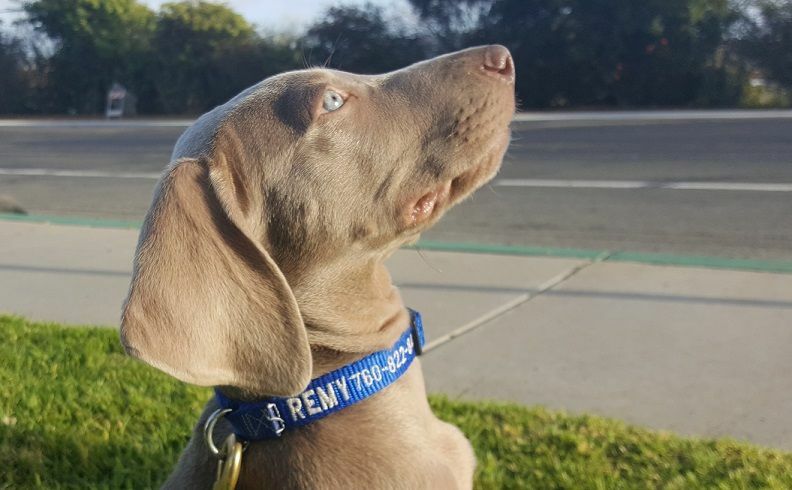 Another suggestion from dogIDs is to put your dog’s phone number right on the actual collar like we’ve done with Remy (below). This can be through embroidery or with a nameplate. Either way, your dog carries your number even if he loses his tag. And obviously, make sure the number is current and working. 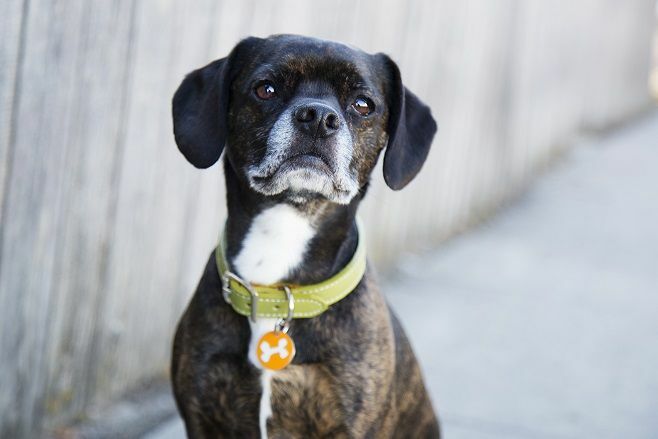 One of the most commonly encountered issues with lost pets is if they’re wearing tags at all, the info is sometimes out of date, according to Aurora Piacentino, senior manager of shelter operations for Animal Care Centers of New York City. The pet owner’s name and general vicinity like “Manhattan” or a zip code is also helpful, according to Piacentino. While the pet’s name is a nice touch, lost animals are likely to be stressed and overwhelmed, so it’s not essential. 4. Make sure your new dog has ID tags right away! When you adopt a puppy—or especially an adult dog—make sure the dog has an ID tag right away, before you even leave the shelter or rescue group. At the very least, he should have a tag with the rescue group’s contact information. I volunteer with a Labrador rescue and, sadly, at least once a year a newly adopted dog gets away from his new family the first day home. An ID tag is a lifesaver in these situations. Sarah Angst is a blogger who writes about Yorkshire terriers, and she told me about a similar experience with one of her foster dogs. 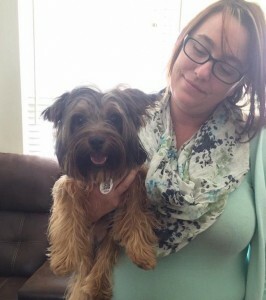 The Yorkie, Edward (pictured with his new mom), had just gotten adopted and his new family hadn’t gotten him a new collar yet. He was riding in the car while the family dropped the kids off at school, and he managed to escape during the commotion. Thankfully, Edward was still wearing his old collar and tags Angst had gotten him, and she received a phone call that someone had found Edward. Angst is a firm believer in microchips but without a collar and tag she said a regular person who finds your pet will have no way to contact you. Always keep a collar and tag on their pets. Angst said in the past she would sometimes wait a few days before putting a dog’s collar back on after a bath. That changed after her experience with Edward. “Make the collar a priority,” she said. 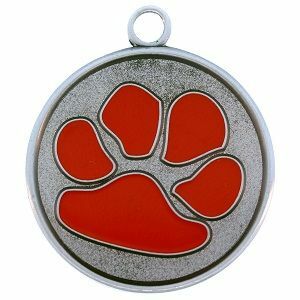 dogIDs is giving away a FREE paw print ID tag to one lucky reader of That Mutt. Just leave a comment below. Let me know which one of your pets could use a new tag. The tag includes the pet’s name on the front and up to 4 lines of information on the back. I’ll choose the winner at random on Wednesday May 18. Must have a U.S. mailing address to win. Which one of your pets could use an updated ID tag? 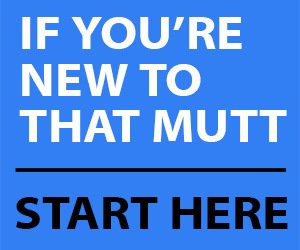 *You can also use coupon code THATMUTT at checkout to save 10% on all products from dogIDs. Kuba could definitely use one! I’ve read not to put your dog’s name on the tag so it’s more difficult to steal him. What do you think? Why would the name make it easier to steal the dog? I’m still on the fence with that one: Kuba would be probably freaked out if lost, so having someone call him by his name would probably add some comfort to his situation. On the other hand, he may just follow kidnappers like a sheep thinking they are good people just because they know his name. At the end, putting the dog’s name on the tag is a matter of preference. It’s the phone numbers that make the difference. The type of dog who would happily follow the kidnapper is not going to care if they know her name or not. And the type of dog who would not follow is likely not going to be duped by some stranger sending weird vibes who happens to use their name. There you go. Pretty sure both my dogs would follow anyone who happily called them anything, especially if the person was holding a tennis ball or food. I haven’t researched this topic, but my gut feeling is that it would depend on your dog. I’d have the opposite worry with my girl. She is well socialized with people, but she’s also very much a shepherd in that she can be aloof and reserved. She knows who HER people are. My worry would be more that she would be reluctant to trust a truly well meaning person who was trying to help her. I stand by this too! Neither of my dogs have their names on their collars. In fact, not many people I know do have their names. I don’t even tell people my dogs names when out on a walk! My neighbours dog only got snatched from her front garden the other month and its just not worth the risk in my opinion! I have my mobile number and “chipped”…that’s it! The idea to put “chipped” on the tag is brilliant! A friend of mine who works in rescue shared some tips. I thought she was pretty brilliant too! I’m also shamelessly patting myself on the back for getting ALL of that info on four lines. I don’t think i want a dog thief to know my dog’s name and be able to call them by their name. We really need dog tags around here. There was a case of homeless people in our town stealing a dog tied outside a store. Thanks to facebook, the dog was recovered, but not before the owner got lectured about how you can never, ever, not even for a blink of an eye leave your dog unsupervised. I sometimes “park” my dog in front of Trader Joe’s. All of our dogs need tags to be added to their harnesses. This is a push for me to get that done. I’ll head over to DogIDs since you’ve mentioned them several times. Thanks! Most important is your own phone number. I’m also a fan of embroidered on the collar, not a separate tag. I also think family last name is often a good idea and city + state. It helps if your cell is out of range or not working for whatever reason. As someone who travels a lot and doesn’t always live near where my area code places me, I think it helps someone figure out if you live nearby (so dog is lost near home) or not. Some rescue groups have tags with the organization name and a number that is assigned to the pup. 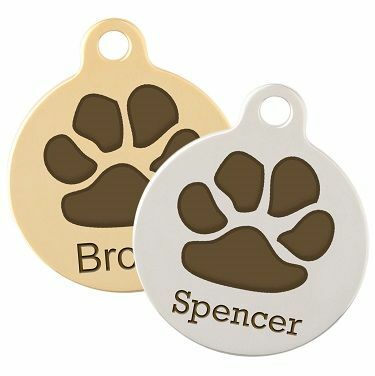 I highly encourage people to leave these on the dog after adoption for a while, because it helps with the problem of dogs who run away or get lost on day #1. I adopted Okami a year ago last January, so she is ~3 years old now. since she is a husky (or malamute mix) weighing ~60lbs I don’t worry about the weight of her tag array. 1x custom ID tag having street address and phone number. in addition on day 1 (when I brought her home, before I even took her to the vet, I took her down and registered her with the local police station (also where you get the dog license here)) where they noted her Chip info and took her picture and registered me as her owner. We’ve always put our dogs’ first and last names, plus our two cell numbers, on their tags. When they visit their grandparents for vacation, we add a piece of masking tape with their grandparents’ cell numbers. Chiquita, is into – “doggy bling with a purpose” ! My dog Bowser could use a new tag! His tag’s “engraving” is rubbing off and it makes me nervous. His current tag has his name and both our phone numbers. I love the idea of putting a phone number on your pooch’s collar – tags can fall or be torn off! So smart! Link is still wearing one of Hiccup’s spare tags, so anyone who meets our dogs would think we either were very uncreative with pet names or have a super weird last name. We definitely are due for a new tag! I like the idea of including a zip code; I’ve always hated the idea of having my address on my dog’s tag. It’s WAY more likely someone at dog park would look at his tag to see his name than someone trying reunite him with us, and I don’t want random people knowing where I live. I guess having the dog’s city-issued license number on the tag would be nice if your city would accept it in lieu of the one they mail you when you register the dog. I hate how the tags rub against each other, but I’m pretty sure my city law requires my dog to wear the one the city sent me at all times. Rue could use a new tag! We inspect her tags frequently to make sure they’re in good shape, so it’s nice to have a tag on hand if the one on her current collar is on its last leg. Plus, when we travel we always take her spare collar and tag along. The info we currently have on her tag is her name on the front, and our last name, cell phone numbers, city and state on the back. I like Tammy’s idea above of using masking tape to add temporary information to a tag. When we travel out of state it would be great to add a local phone number to the tag. My second foster could use an updated name tag. Actually, I like the idea of our info embroidered on the collar and will have to look into getting those for our dogs. Instead of using my dog’s first name I would use my last name and telephone number. I’ve seen the dog collars with the embroidery I really like those too. I’ve purchased 2 collars for my new pup but not a name plate yet….I don’t know what I am waiting for. We recently got new tags for all of our dogs. We put my cell, Ali’s cell, and dog’s name on our tags. I saw an interesting post from Pamela at Something Wagging about putting a website URL on the tags for people traveling in RV’s. She created a simple webpage and every time she moves updates it with GPS coordinates or a map. Her point being that being in uncertain areas there may be no cell service and your address is constantly changing. Our dog is a boxer mastiff mix and he’s huge. I think our two cell numbers and chipped is great info to have on his tag. We have collars w/plates on them for our dogs & on it… Our last name, city & state & our 2 cell #’s. I also have a home again tag hanging on one of their collar’s. I like added “chipped”. W/5 dogs, a new tag for 1 would push me to go ahead & buy new for the rest! Missy & Buzz always wear their tags – you just never know what might happen, and if they got away for whatever reason it would be so much harder to be reunited with them if they didn’t wear them. They have their names and my phone number on them (my husband is out of the country on a more or less regular basis, so his number wouldn’t be very helpful). I do like the idea of the name and number embroidered on the collar. I put “I’m lost, call Rachelle” and my phone number on the tag. An email address might also be useful. I’m not sure about writing “Reward for return.” It could help but I’m afraid that some people might steal a dog just to get the reward. It might be a good idea to have two tags–one with “Reward for return” to use while traveling, and one without the phrase “Reward for Return” for daily use. I would not put a telephone number boldly on a dog collar, because when you are walking your dog, your number might be spotted by the wrong person–I’m not comfortable with having my phone number given out too freely. My dog always wears her tags when she is out. When I had a cat, she always had a collar on, complete with tags because I was afraid that she’d get lost if she ever slipped outside (even though she was an indoor cat) or while I was traveling with her. Pup’s current tag is hanging by a thread of metal, it’s going to wear through any second now. Not overly worried about her going a few days without it because she still has the county license tag and the microchip ID tag but a fancy new tag would look “Grrrand” as Jock the Scottie Dog would say. all of my girls could use tags. however, they dont wear colars at home. they only wear tags and collars when we go out somewhere. i would like one for my oldest that says she is deaf, has dementia, etc. plus name, address, tn, etc. my girls wear harnesses, however, i do carry their collars with use when we go somewhere, i need to figure out now to put their tags on their harnesses. my oldest is microchipped but the 2 younger ones are not. the dog breeder/handler/show was against them. apparently one of her dogs that she sold to someone, got a microchip, it migrated and killed the dog. i also need to change the vet infor on my tags, since i no longer go to that vet.